"Tulips Personal Checks" product is already in your cart. Fields of gorgeous flowers make these Tulips Personal Checks a memorable display and makes writing checks so much easier! The variety of colors is awesome as they stand tall with their blossoms slowly unfolding in shades of orange, yellow, pink, red, and purple. The glory of nature and the tranquil spirit they inspire will make these checks a great one for those who enjoy gardening and nature at its very best. 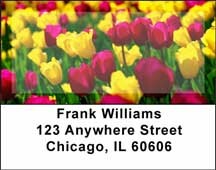 With images that will always show springtime you will be delighted with these Tulips Personal Checks that provide a stimulating way to think positive and let the sunshine of these beautiful flowers create a bright day for everyone.